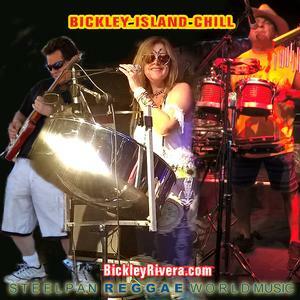 Innovative recording artist Bickley has just released reggae/world album "Positive Vibez" in the US,CANADA AND HAWAII. Her 3-piece group performs reggae music, with soca, calypso and chill music. Other albums, "Breaking the Mold", produced by Steve Oliver featuring artists as Tom Schuman (Spyro Gyro), Will Donato, Andy Narell and more, made international attention when single "Let's Kick It" made it to #16 on the Smooth Jazz charts, #1 UKs Kjazz chart and is on TV (Music Choice). Prior album "Chill in After Five" had 4 singles featured on TV The Weather Channel. Ms. Rivera has appeared on television, many large-scale festivals, her music and interviews aired on radio stations in over 50 countries. She has opened for national groups, such as "America" and performed with international artists, Tony "Kitch" Paine (son of legendary Lord Kitchner), Jazz singer Joan Cartwright, Eugene Grey (touring guitarist for reggae-star Burning Spear) among others. Bickley Rivera has performed in the Northeast, Midwest, Southeastern and Bahamas and Trinidad.